¡MAYDAY! 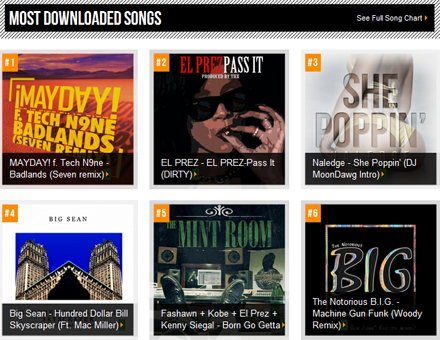 ‘Badlands’ (Seven Remix) Climbs To #1 Most Downloaded Song On AudioMack! The ¡MAYDAY! army is in full swing as ¡MAYDAY!’s “Badlands” (Seven Remix) has officially climbed its way to the top spot of the most downloaded songs currently on AudioMack. The official remix from ¡MAYDAY!’s Take Me To Your Leader was served up courtesy of longtime Strange Music producer Seven, who completely revamped the fan-favorite into an entirely new track. The popularity of the ¡MAYDAY! and Seven combination is proving to be strong as the track climbed its way up within hours of its release, ranking above tracks from Big Sean, Kendrick Lamar, and El Prez. Still sitting at #1, ¡MAYDAY! and Seven may want to consider more work together. Click here to download ¡MAYDAY! ‘Badlands’ (Seven Remix) featuring Tech N9ne on AudioMack! What other ¡MAYDAY! tracks would you like to hear Seven remix?